Car2go is a German car rental company. It is a subsidiary of Daimler AG providing carsharing services in European and North American cities. The company offers exclusively Smart Fortwo and Mercedes-Benz vehicles and features one-way point-to-point rentals. Users are charged by the minute, with hourly and daily rates available. The service forgoes the typical centralized rental office, and cars are user-accessed via a downloadable smartphone app wherever they are parked. 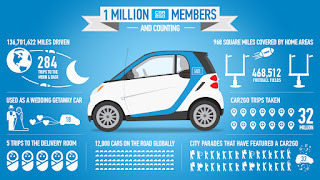 As of July 2017, car2go is the largest carsharing company in the world with 2,500,000 registered members and a fleet of nearly 14,000 vehicles in 26 locations in North America, Europe and Asia. Daimler introduced the service in Ulm, Germany, in October 2008, where it was developed by one of its internal business innovation units and was first tested exclusively by Daimler employees. Starting in May 2015, car2go added a $1 'Driver Protection Fee' for each ride to offset the lowered deductible. Since inception, car2go withdrew from several locations, including Britain, where it closed its service in London and Birmingham after only a year of operation. Due to a lack of charging stations, car2go in San Diego, California, decided to replace all of its all-electric vehicle fleet with gasoline-powered cars starting on 1 May 2016. When the service started in 2011, car2go expected 1,000 charging stations to be deployed around the city, but only 400 were in place by early 2016. As a result, an average of 20% of the carsharing fleet is unavailable at any given time because the cars are either being charged or because they don’t have enough electricity in them to be driven. At the end of 2016 car2go left the San Diego market. 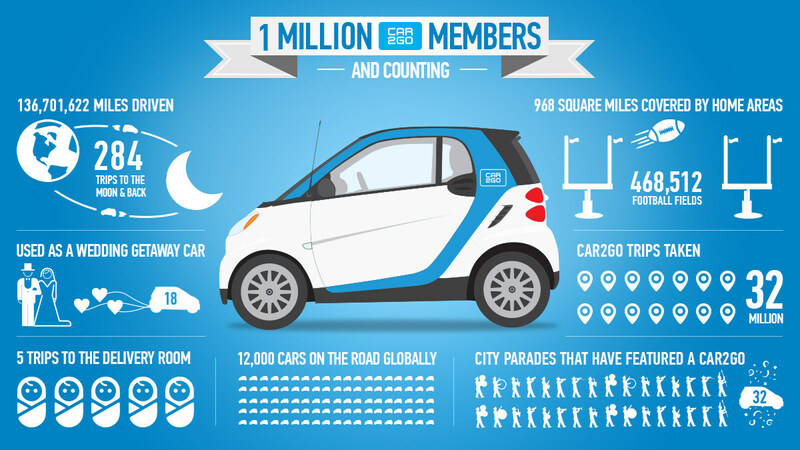 As of July 2017, car2go operates over 14,000 vehicles, which serve eight countries and 26 cities worldwide with over 2,500,000 customers. 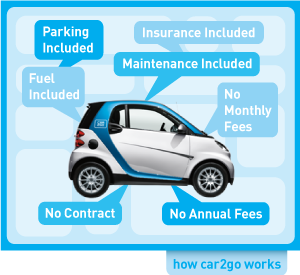 The car2go business model is similar in all markets, although rates vary by location. The company charges a per minute rate, with discounted fixed rates for hourly and daily usage also available and applied automatically. The rates are all-inclusive and cover rental, gas, insurance, parking (in authorized areas), and maintenance, a low fixed annual fee is sometimes also charged. In most markets, car2go vehicles can park in either specially designated parking spots, or in standard parking areas, with a special permit from the local municipality. Users have the option of refueling cars with a supplied charge card, customers receive bonus minutes for performing this service. In most cities, car2go offers only two-passenger vehicles, namely two types of Smart Fortwo "car2go edition" vehicles: gasoline-powered, and electric-powered. The gasoline-powered cars can be found in three variants based on roof configuration: "original" with integrated solar panel roof; "upgraded" with a panoramic polycarbonate roof and power side mirrors; and "new" featuring a standard roof. 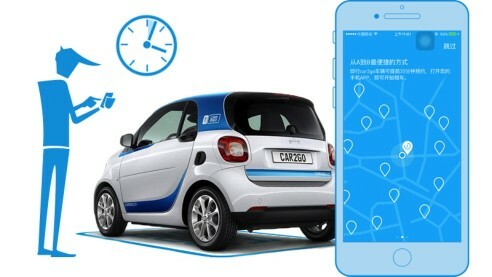 Electric car2go models are currently available in several markets, have a range of 84 miles (135 km), and need to be recharged every two or three days. In its Canadian markets, car2go has a pilot program in place to supplement its fleet with a small number of four-door Mercedes B-class vehicles. Car2go is currently adding Mercedes GLA and CLA to its locations worldwide. First-party and third-party apps for mobile devices allow users to locate and reserve vehicles. When reserving a car online, the customers are able to see the car's fuel gauge (gasoline-powered cars) or the battery's state of charge (electric-powered cars), so if the customer wants to go for an extended drive, they can find the right car for that trip. No surge pricing, no small talk with chatty drivers, and no wondering "they're taking THAT route?? ".